The Joes invade San Diego Comic Con! As the Blue Ninja storyline winds down, the Joes attempt to intercept an arms exchange that could have world-wide repercussions. Meanwhile, Destro and Darklon ignite a feud that could bring the Joes into the mix. 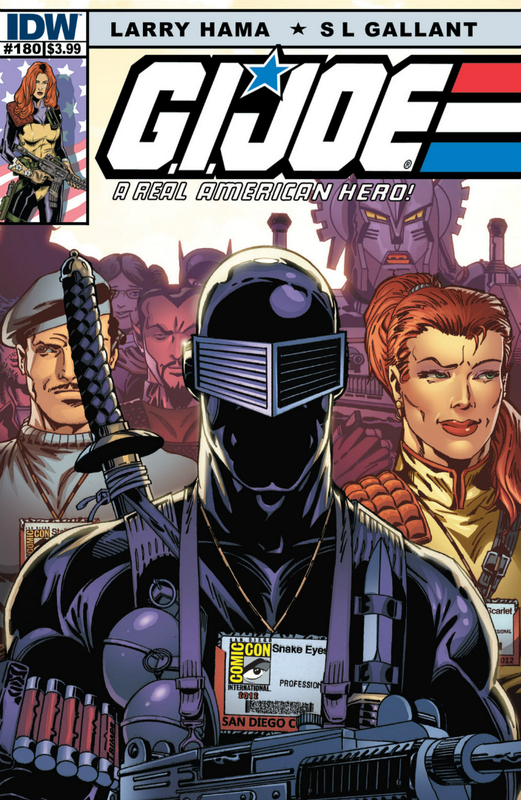 Larry Hama had hinted at this SDCC issue several months ago during an interview with "What's On Joe Mind." The atmosphere in this issue is lighter and a bit more slapstick than what we've seen in ARAH lately. After perhaps too many months of the Blue Ninja storyline, this makes for a refreshing change. Hama introduces some new plot divergences in this issue. One of his trademark signatures in his Marvel run was running several different storylines at once. This allowed him to balance action with characterizations, and gave him the opportunity to better utilize the huge cast of characters at his disposal. The Blue Ninja storyline may have seemed too long because there were no parallel or intersecting storylines that broke up the action. It's nice to see the return of the multiple storylines. Throughout the Blue Ninja run, I had thought Destro's absence was rather odd. Destro's had a long history with Billy, beginning with saving his life after the failed assassination attempt on Cobra Commander, and interacting and allying himself with Billy several times afterwards. While I can understand that Destro would not be too pleased with the recent romance between Billy and the Baroness, nor would he be particularly happy that the Baroness feels the need to rush out to avenge him, Destro is both a man of honor and a man deeply in love with the Baroness. It's odd to that he would let her go into battle alone. In this context, his appearance at the beginning of this issue makes a lot of sense and better fits the character as we know him. Scenes played out in this issue suggest that his role will be larger in upcoming storylines. Destro has been conspicuously absent throughout most of the ARAH run. He is arguably one of the best developed and more interesting characters in the G.I. Joe mythos, so any future storylines that involve him can only be good news. While reading this, I can't help but to think that S.L. Gallant had a lot of fun illustrating this issue. There are tiny (and sometimes, not so tiny) Easter Eggs scattered throughout the issue, especially in the SDCC scenes. After so many issues of Blue Ninja battles, drawing whatever pop culture references he wants and hiding them in the pages like a "Where's Waldo" was probably a fun and refreshing change. I especially liked the scene where Gallant is sitting alone at the IDW booth giving a convention attendee directions to another signing. I doubt that at the real SDCC, Gallant will be lacking fans who appreciate his work. "Don't bother seeing us out. We know the way from studying satellite photos." A refreshing, off-beat change from the recent storyline that sets the scene for new plots. Recommended.